At the same time that Mike Joyce, Founder of B9Creations, had dreams of creating a 3D printer that would change the way people operated and innovated, Trevor Vipond was dreaming about his future in 3D design, creating and designing in ways that others had never done before. It was this common purpose that made a perfect fit – a company striving to make it easier for creators to create, and a creator aiming to make a career of showcasing his truly unique flair. Trevor was born with an artistic ability; one that led to an education in 3D design, which then led to a future creating and designing fine jewelry, like engagement rings and wedding bands, for Vancouver’s award-winning "Best Custom Jeweler," Cavalier. 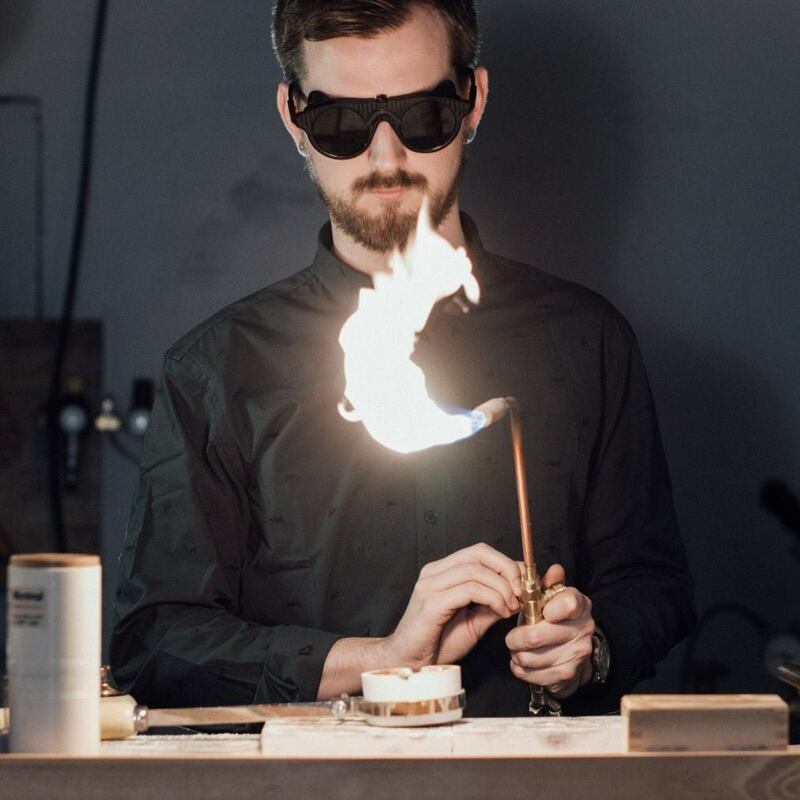 While Trevor’s work at Cavalier is extraordinary, he also loves to create pieces outside of his fine jewelry work – stopping nothing short of unique, artistic, unexpected, and out of the box. What Trevor at first considered a creative outlet eventually became a full-fledged business, Hewn, and the key to a career showcasing his unique flair. Hewn has a naturalistic, wild essence, drawing from skulls and the bark of trees while maintaining a sleek, polished finish. While Trevor was still in school, completing his degree in Goldsmithing and Jewelery Design, he had been on the lookout for a 3D printer that was inexpensive, but would still give him the resolution he needed as a designer just starting out. The B9Creator stuck out to him, and he took a chance alongside hundreds of others who backed B9Creations’ early crowdfunding campaign on Kickstarter. As he graduated and began working, he had plenty of time to tinker with the machine. He would take the concepts he learned in design school, applying them and refining his own style. But once his schedule started picking up, he wasn’t able to devote the time needed for calibration and vat re-coating. He needed to spend those precious hours with customers, designing rings, or cutting stones from rough rock. B9Creations, at the same time, knew that their customers wanted a 3D printer they could depend on to work, especially when they didn't have time to do much more than press a button or pour resin in a vat. B9Creations' team spent countless hours developing a new machine with better processes for jewelers that would allow for this desired ease of use, speed, and consistency, alongside the impeccable resolution, surface finish, and detail that matters to jewelers. He began looking into a new 3D printer, considering all competitors in the space. But because of his experience with B9Creations, he was already sold on the brand-new B9 Core Series. When Trevor was just starting out his career in 3D designing and printing, B9Creations had been gaining their footing as well. They understood what it was like to be competitively emerging in the world, and made sure to provide him with the resources that would help him grow in creativity and experience, too. His customer interactions with the B9Creations team were always extremely helpful, quick, and completely free. If he had any questions about printing, casting, or anything in between, he knew there would be someone there at the other end of the globally recognized Forum or the Tech Support phone. And while the top-notch support system he witnessed from B9Creations was a huge factor, their newly developed machine was an even bigger factor. The B9 Core Series was built for speed, simplicity, and value, topping the charts in each category and making it easier for jewelers to focus on what really made them passionate about their jobs. No calibrations, no vat re-coating, speeds over 4x faster than anything on the market, and a repeatable accuracy he had come to expect were a few of the reasons he knew he wanted to stick with B9Creations. "The B9 Core Series resolves every issue that I had, and the lack of calibration was a Godsend." 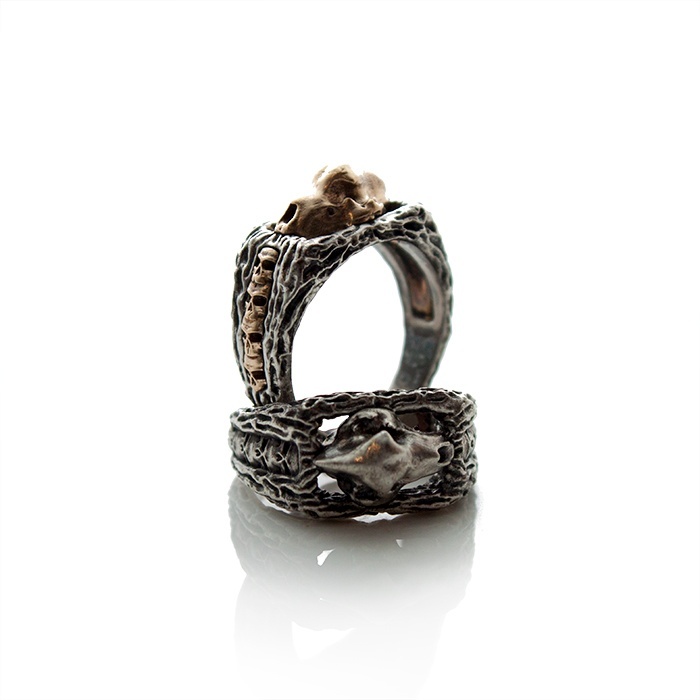 The ease of use of the B9 Core Series and low cost per print allows him to alter faces and expressions on the skulls, intricate details in the bark, and differences in ring size without having to worry about wasting his and his customers' time recreating and perfecting new iterations. He knows he can depend on the B9 Core Series for consistency, quality, and guaranteed success and support throughout the process. "In the 6 months I've had my B9 Core 550, I've doubled business"
Hewn has become a way for Trevor to exhibit his creativity in a way that's new and different from his elegant fine jewelry work and gorgeous stone cutting. And because he is able to produce his pieces in a fashion that appeals to a unique, targeted market, the B9 Core Series enabled him to pay off his machine in 2 months and double the size of his business in 6 months. Trevor's company, which exemplifies the kind of business B9Creations had in mind when creating their new 3D printer, has grown and become successful, bringing to life the dream that Mike and his original crew had when laying the groundwork for growth, innovation, and resolving a gap in the 3D printing industry for high-resolution printers. Photo credit for image of Trevor: Cavalier. 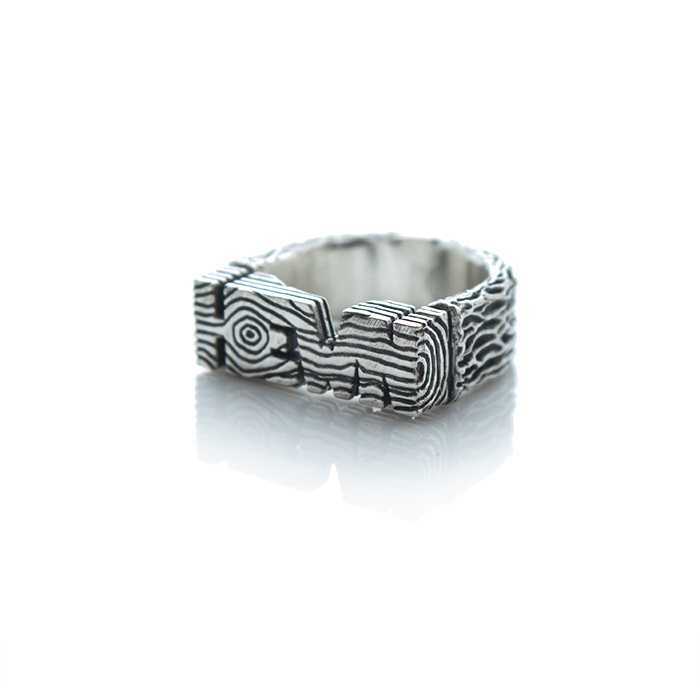 Photo credit for jewelry images: Hewn.